This UK classic was the flagship model of the 1950s; probably the most popular model that many men chose to wear if they had the extra cash to splash out for a ‘private’ frame rather than the NHS freebie. It is a solid ‘Library’ frame and is comfortable to wear. 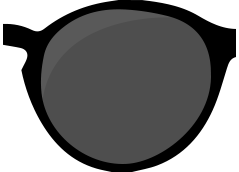 A solid, strong square shape with a thicker upper rim. Fitting notes: A medium to large library frame with a slightly narrower bridge fit, which enables the frame to sit higher on the face.